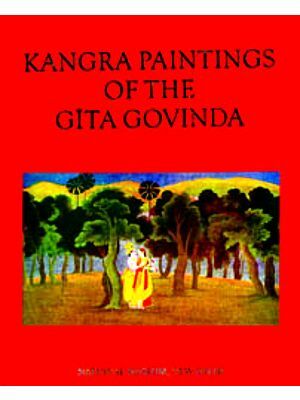 The Darbhanga Gita Govinda is the Eighth in the series of monographs by Kapila Vatsyayan on the Gita Govinda and the miniature painting tradition of India. In the earlier monographs e.g. Jaur Gita Govinda Assamiya Gita Govinda etc. the author examined assiduously the relationship of the text and the visual image. The Darbhanga Gita Govinda is a set belonging to the eighteenth century. It exemplifies both the continuity and changes which take place over time in comprehending the text as also its visual representation. Through her monographs on the Gita Govinda the author has encompassed the pictorial journey of Gita Govinda over a period of four centuries. Author of over a dozen books and countless research papers Kapila Vatsyayan is internationally and nationally acknowledged for her width and depth of comprehending the dynamics of Indian culture at various levels. Each of her earlier works has been a path breaker at the level of theory and praxis. By the end of the sixteenth century, but more specifically the mid-seventeenth century, a distinct Rajasthani school of miniature painting had emerged. The Mewari idiom dominates until the end of the seventeenth and early eighteenth centuries. A clearly identifiable Malwa school develops in the latter half of the seventeenth century. Bundi, Bikaner and Kotah, although late arrivals, emerge as distinct schools. But by the eighteenth century, there is a decline. In the early part of the seventeenth century, creative energies manifested themselves in many ways. The mythical and historical had inspired painters and stylistic individuality within specific schools was an inner creative need. The Ramayana and the Mahabharata were popular, but along with it was the fascination of the themes of the Baramasah, Nayikabheda, Ragas and Raginis and above all the Bhagavata Purana and the Gita Govinda. The last holds a key for study of the evolution of many stylistic motifs and conventions which were subsequently freely used outside the framework of the Gita Govinda illustrated manuscripts. Although much has been written on the emergence and development of the diverse schools of Rajasthani painting and the characteristics which distinguish one school from the other, the role oft he Gita Govinda in shaping the pictorial styles has not been as clearly defined. 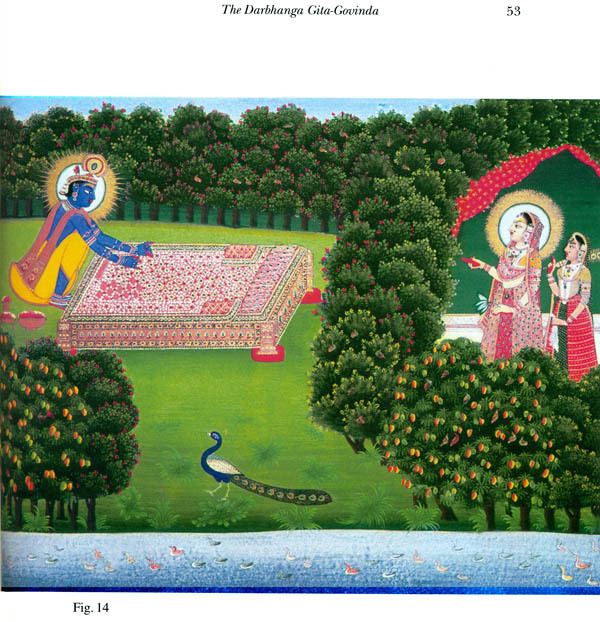 A perusal of the Gita Govinda illustrated manuscripts from Rajasthan offers convincing proof of the unique impact of this work on the arts of Rajasthan, particularly music and painting. From the third quarter of the sixteenth century to the first quarter of the twentieth century, at least twenty complete sets must have been executed. Many more may come to light if the unpublished collections of the several private and public libraries are carefully examined. Even from the illustrated manuscripts studied by the author, it should now be possible to place these manuscripts in a chronological order with a rough identification of provenance and sub—school. As has been remarked elsewhere, the first Gita Govinda illustrated manuscripts begin to appear in the late fifteenth or early sixteenth century. The illustration of the manuscript discovered by Mazmudar is the earliest belonging to a period roughly from 1485 A.D .to 1525 A.D. The illustrations are restricted to the ten avataras and stylistically they are a close parallel to the Jain miniatures of the period. Possibly, the manuscript was executed in Gujarat. Their abstract quality without human figurative drawing is a distinguishing feature. Thereafter appears the set of the Gita Govinda illustrations executed in the Caurapancasika style possibly belonging to the period 1525-1575 A.D. A few folios are in the collections of the Prince of Wales Museum, Bombay. judging from these folios, it would appear that the set contained nearly 150 folios and that an attempt was being made to illustrate each verse.? For the first time in these paintings appear cuckoos, birds and animals, which can be directly related to the verbal imagery of the poem. Unlike the illustrated manuscripts of the Ramayana and the Mahabharata, the artist is obliged to discard the straight sequential narrative of events; he adopts instead another technique of transforming the verbal imagery and phraseology into pictorial motifs. A detailed reappraisal of this set is essential because it is the commencement of anew pictorial vision which is clearly different from the narrative approach of Indian relief sculpture. The content of the Gita Govinda thematically is thin; its strength and power lie in the dramatization of the inner emotional states through a rich and multilayered structure of similes and metaphors. Also, here the drama of human emotions takes place through the narration, reminiscence and fantasy of two characters: the third (i.e., the Sakhi) is the bridge between the two. 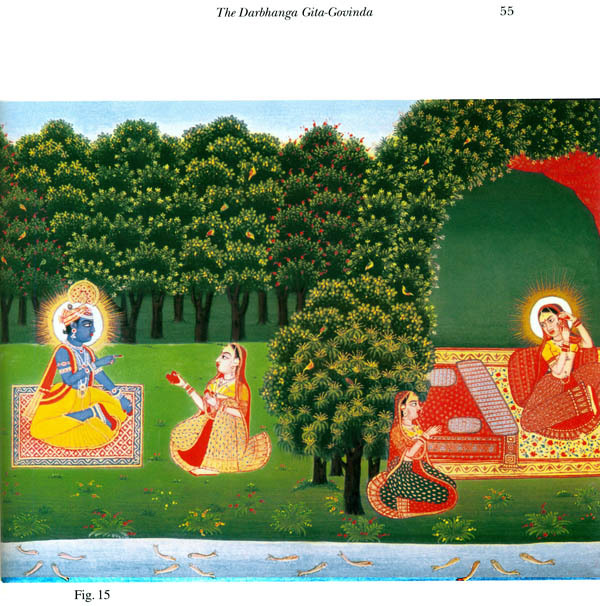 The painter of the Gita Govinda in the Caurapancasika style presents a pictorial counter part by dividing his surface through central trees, arches and bowers. This enables him to demarcate areas and also provide continuity. The change from the geometrical segments of the Jain painting is unambiguous: the difference between this treatment of flat surface and the multiple planes of Moghul painting is also clear. 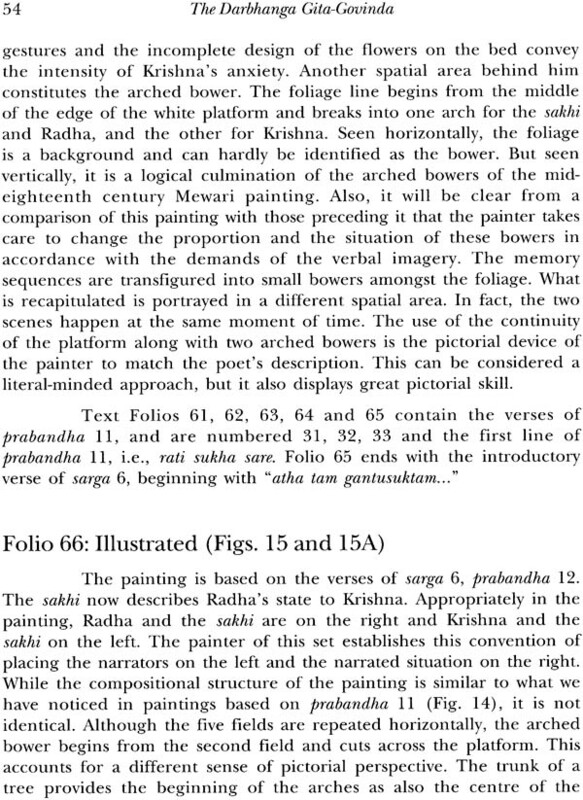 This compositional structure of the paintings of the set marks the beginning of a pictorial vision which is quite distinct from that followed in the Bhagavata Purana and Caurapancasika paintings in the same style. This is in no small measure accounted for by the demands made on the painter by the text he was handling. Elsewhere there will be occasion to analysee the folios of the set anew from this point of view. The provenance of the painting remains debatable. Almost contemporary are three other sets which were certainly executed in North Gujarat and Kankaroli. Scholars have so far placed them in the last decade of the sixteenth century and the first decade of the seventeenth century. 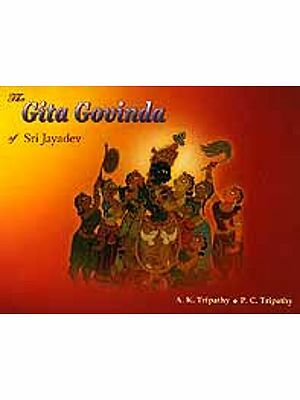 The first is the pocket Gita Govinda with fifty illustrations in the B.J. Institute of Indology Ahmedabad. The paintings are executed in what has been termed as a folk idiom. 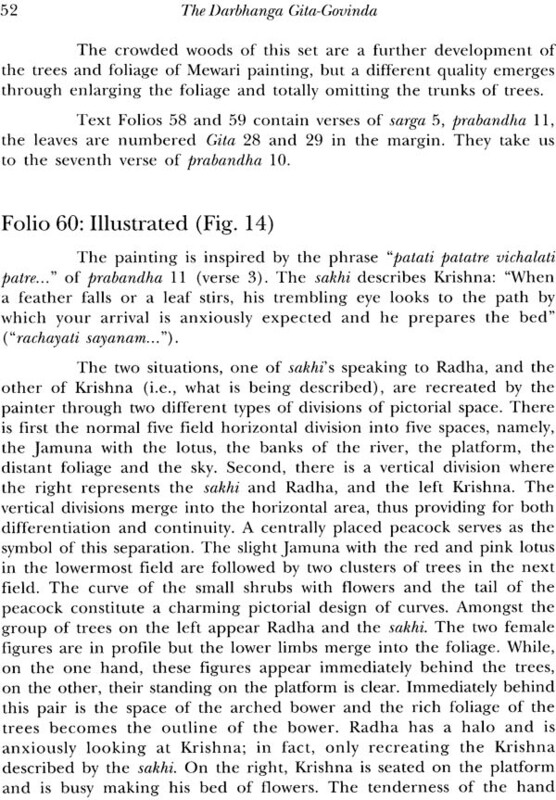 Although there is some element of truth in this a comparison of the paintings of this set with those of the illustrations of the Gita Govinda in the Caurapancasika style makes it clear that these are not totally unrelated happenings in different regions of India. The fundamental principal governing spatial compositions is variations of a similar if not identical pictorial vision.